The videos show the Indian Army's actions in J&K, with one depicting a soldier expressing remorse for the use of pellet guns in the Valley. New Delhi: Over the past couple of weeks, a new set of anti-India propaganda videos are being pushed out in Pakistan. These videos, centred on Jammu and Kashmir, aim to show India and its army as gruesome aggressors. The most striking aspect of the videos is their shoddy production standards. Quite literally, one of these videos was made by and features a Class 8 student. The videos, being shared by Pakistan’s political, military, and media establishments, is being spread over Twitter, YouTube and, other social media. 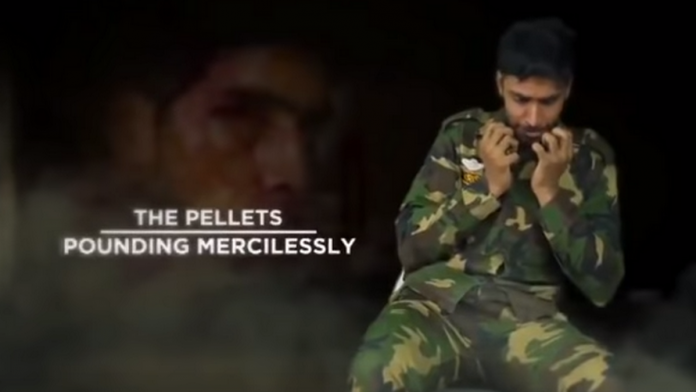 The first video depicts an Indian soldier regretting the pellets he used on Kashmiri protesters. As a poetic voice-over tries to speak out his thoughts, the soldier holds a gun and contemplates whether he should commit suicide. The video has been produced by Pakistan’s PTV World, one of the leading media houses of the country. A Class 8 student from Lahore, who also features in the video, produced the second video. As she moves around angrily — pointing out the ills the Indian Army commits in Kashmir, she argues that this will lead to more Burhan Wanis in Jammu and Kashmir. Pakistan’s PTV World is behind this video as well. This time, they use a poem by the legendary poet Faiz Ahmed Faiz in the background, as a montage of the Indian security forces’ crackdown in Kashmir is put together. The videos appear to be released in wake of Kashmir Solidarity Day in Pakistan, which is held on 5 February every year. Pakistan observes it as a national holiday to show solidarity with citizens of Jammu and Kashmir. Given that Maqbool Bhat and Afzal Guru’s ‘death anniversaries’ are around the corner, the sharing of these videos could be going on for some time. “It’s a Kashmir Day propaganda video but the Pakistani state has been badly exposed this Kashmir Day when it was found cracking down against peaceful Pashtun Movement and killing one Arman Loni,” Pakistani journalist Taha Siddiqui, the founder of Safe Newsrooms, told ThePrint. “If anything, the state should introspect and stop abusing its own citizens instead of deflecting attention through days like Kashmir day which have no historical significance,” he added.